This year is destined to be a spectacular one for architecture. 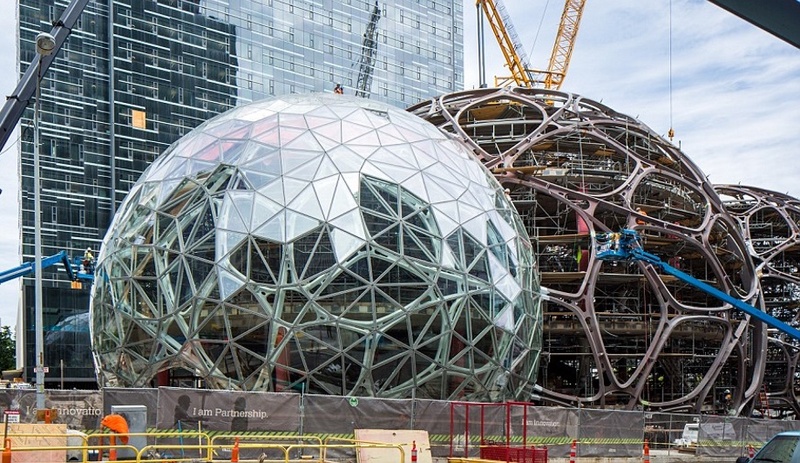 Dozens of impressive buildings are nearing completion, from Jean Nouvel’s Louvre in Abu Dhabi to the Amazon Biospheres in Seattle. Here are the 2017 buildings we’ve got our eye on. 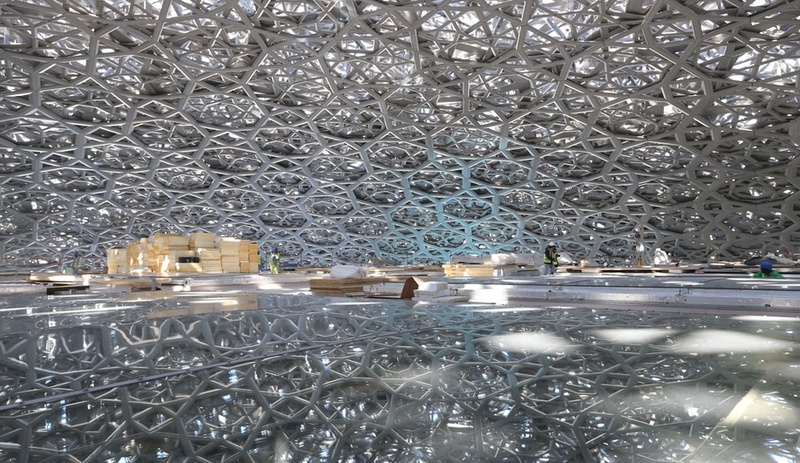 Back in 2007, when the Louvre in Paris announced the construction of a sister museum in Abu Dhabi, a completion year of 2012 was set. 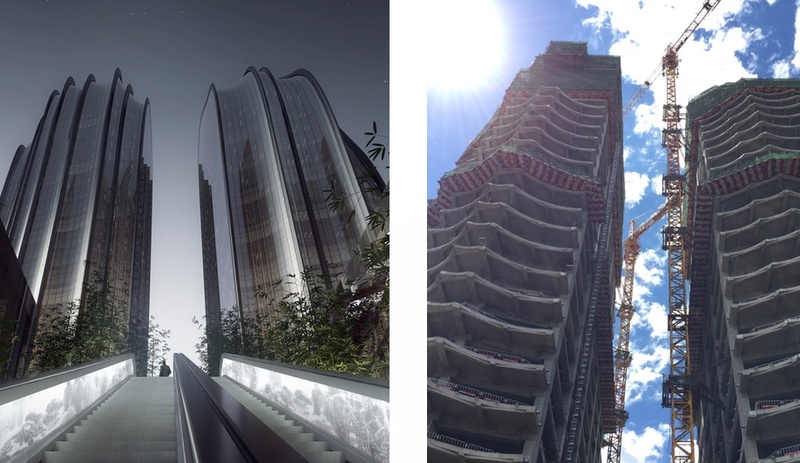 Five years after that projection, Jean Nouvel’s masterpiece is almost done. 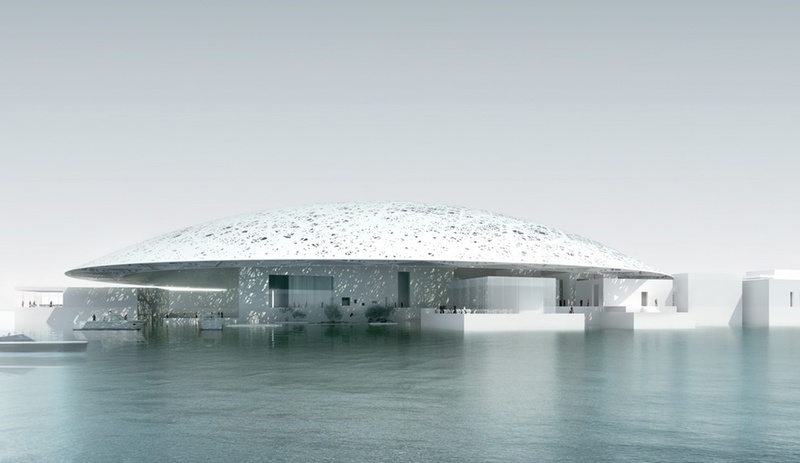 Perched on Saadiyat Island and extending over the waters of the Persian Gulf, the Louvre Abu Dhabi appears as a low-lying disc hovering over irregular geometric volumes. The white dome (which is actually a double dome stretching 180 metres in diameter) is a nod to emblems of Arabic architecture and the forms of mosques and madrasas. Its latticed skin is a decidedly contemporary move, however, and the perforated, geometric openings are assembled in overlapping layers. The overall look resembles interlaced palm leaves. Light pours in through these apertures, creating mesmerizing dappled patterns on the floor. 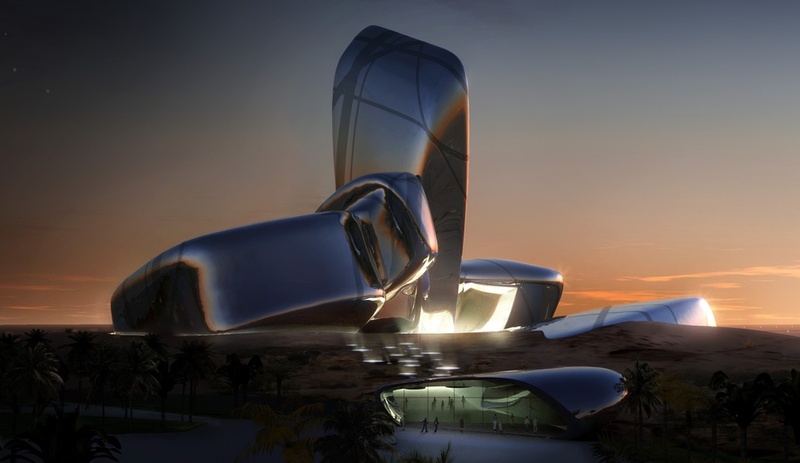 Perhaps the most fascinating gesture will be the canals that flow into the museum from the surrounding gulf, weaving between the permanent exhibition spaces. 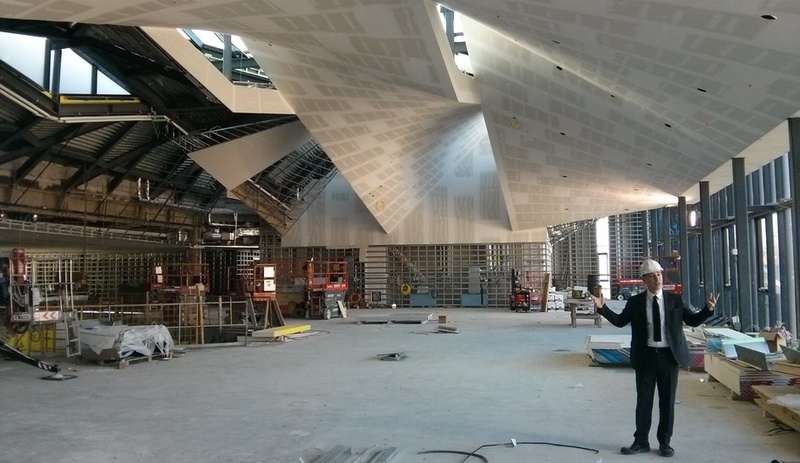 When completed (any day now, we’re told), visitors will be guided indoors and out as they traverse the collections. For a closer look at the project’s progress, watch this stunning aerial footage. 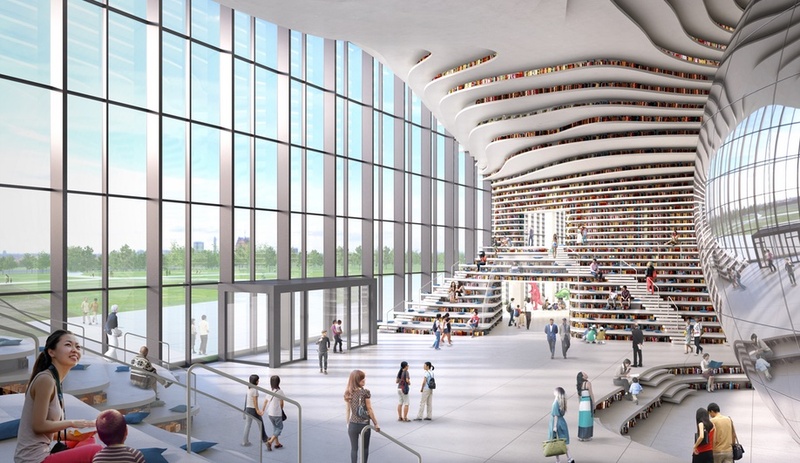 This hotly anticipated library in Tianjin, China, is so close to completion that no more progress images are being shared for now — an official announcement is imminent. We sure hope so. 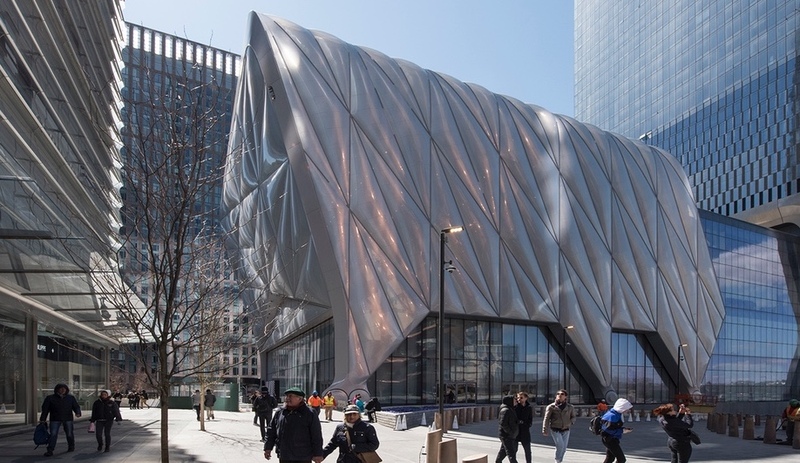 If the final product delivers anything close to what renderings depict, this will be unlike any other library in the world. The literal and symbolic centre of the 34,200-square-metre structure is the Eye – a giant, mirrored, spherical auditorium that sits within an oval opening that punches through the building. 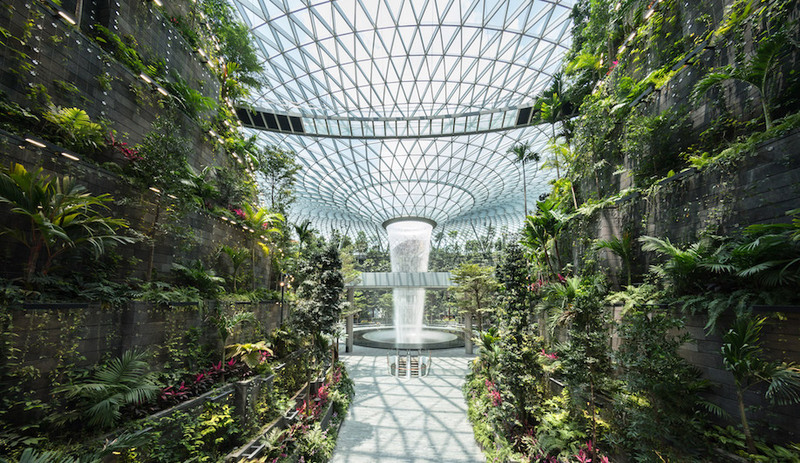 The Eye enlarges the space and reflects its inspiring surroundings: curvy, terraced bookshelves; a rippling, contoured ceiling; and a swath of green space just outside the entrance. This, the ground floor, provides reading areas, while dedicated reading rooms and lounge areas are found on the two floors above. The third and fourth levels contain offices, computer and audio labs, and meeting rooms. A below-grade level contains archive and storage spaces. 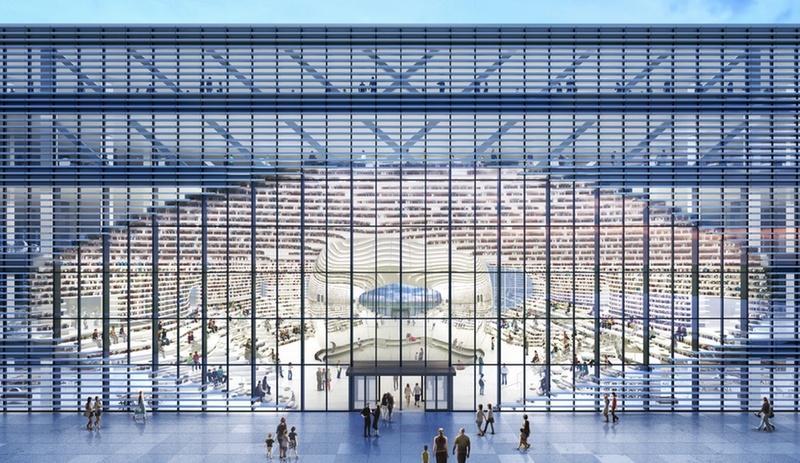 The Tianjin Binhai Library will form part of the Binhai Cultural Centre, a complex comprised of four additional cultural buildings by such firms as Bing Thom and Bernard Tschumi. “Cultural corridors” link each of the structures. 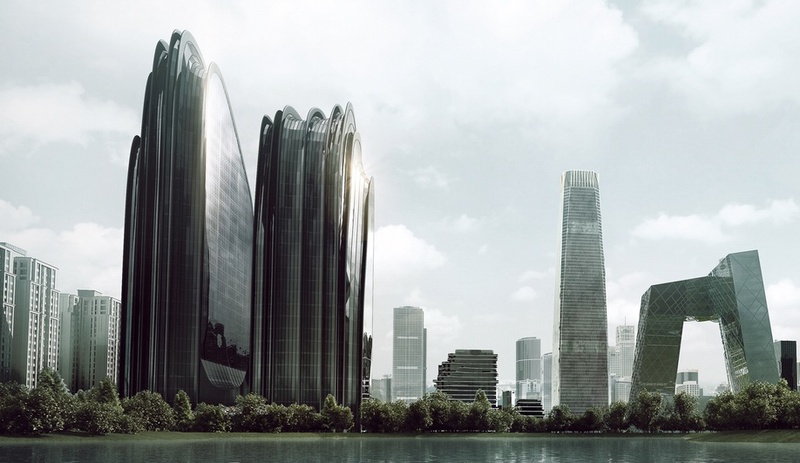 Designed by MAD Architects, a pair of towers in central Beijing topped out last summer and are likely to reach completion before 2017 is out. Part of a multi-building development known as Chaoyang Park Plaza, the 120-metre-tall towers are sure to offer sweeping views of the surroundings, just like the mountainous landscapes they are meant to evoke. Drawing upon the tradition of Chinese landscape painting, the two forms gently heave and slope like the ridges and valleys of the region. Indeed, the ridges’ internal ventilation and filtration system draws a natural breeze indoors, creating an energy-efficient system. The project was awarded LEED Gold by the U.S. Green Building Council. Located to the south of the towers, and also under construction, are four office buildings loosely shaped like river stones (also by MAD). Smooth, round, and each with its own features, they bring the plaza’s evocation of nature into even sharper focus. 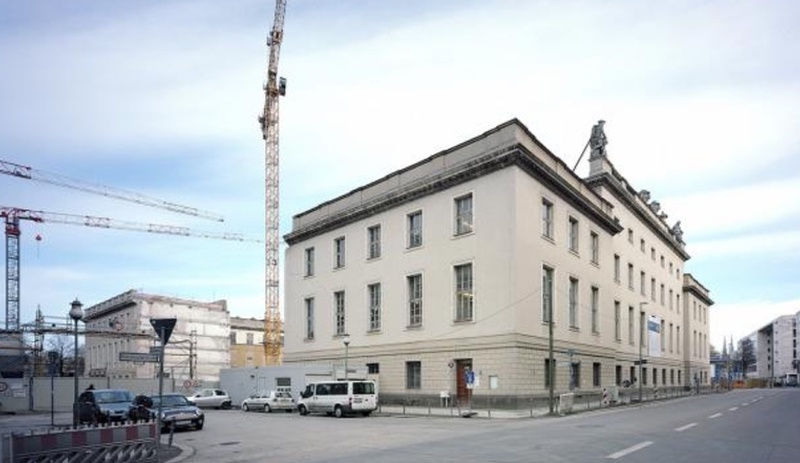 Standing outside the landmark building that houses Berlin’s music school Barenboim–Said Academy, you’d never imagine that behind its austere walls is a Frank Gehry project. 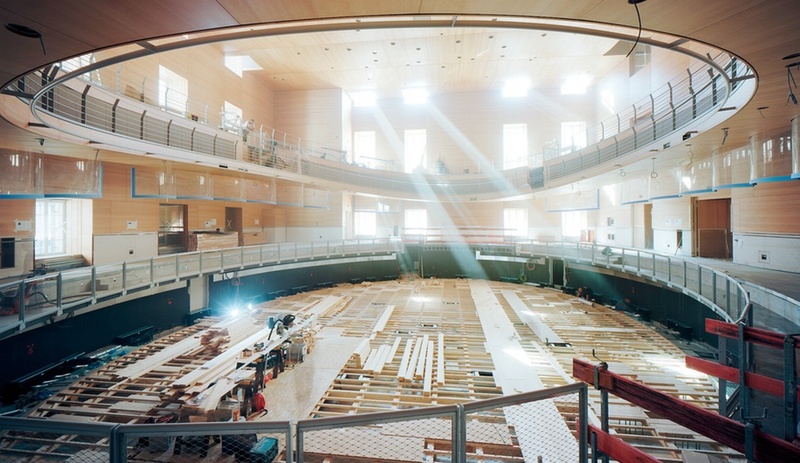 In a few weeks, the building that was originally constructed as a storage facility for the state opera’s sets will reopen its east wing to inaugurate the Pierre Boulez Saal Concert Hall. The intimate venue seats 682 and is designed with acoustician Yasuhisa Toyota using principles developed by French composer, director and theoretician Pierre Boulez. The spiralling performance hall circles a balcony that appears to defy gravity and has floor-level seating around a central stage to draw the audience and musicians closer together. Wrapped in wood, the interior is bathed in natural light that washes in through a series of windows above the upper gallery. 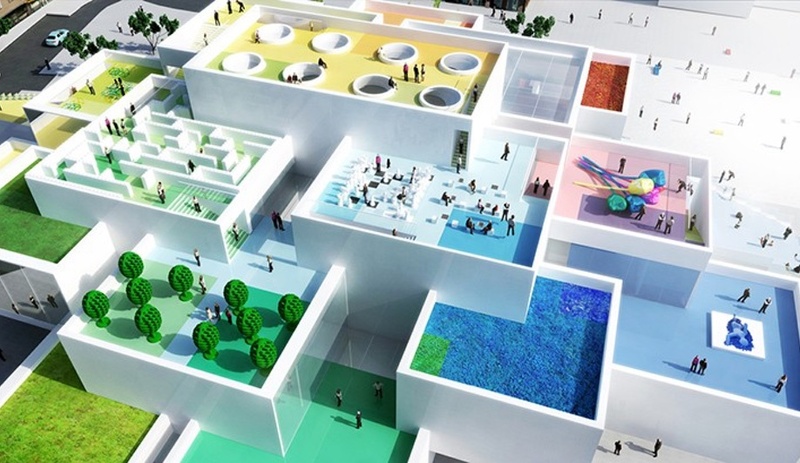 Slated to open this fall, Bjarke Ingels’ Lego House is shaped like a mountainous stack of white blocks that will serve as a hands-on experience centre where visitors from around the world can explore the possibilities of every architect’s favourite toy. 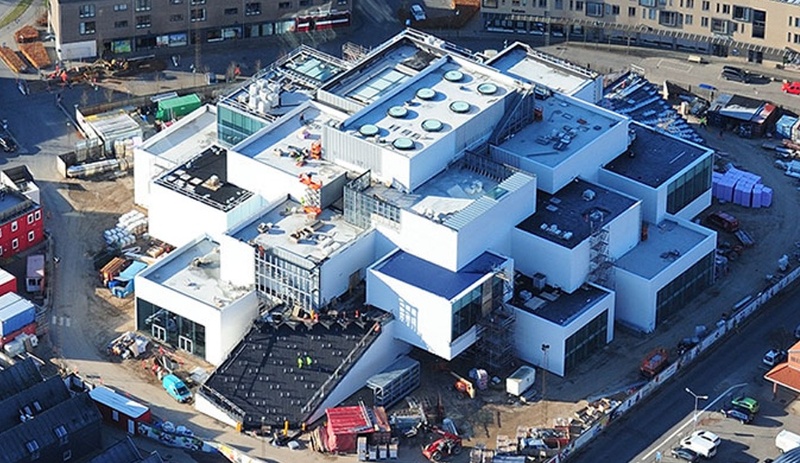 The 12,000-square-metre structure is truly shaping up in Lego’s place of birth, Billund, Denmark. The eight Lego studs that are featured on the centre’s topmost “brick” are now clearly visible. Those same studs are now being added to the Pixelmelt Terraces, two outdoor spaces that will resemble Lego base plates melting into the ground. All 29 terraces will be splashed with iconic Lego colours: blue, red, yellow and green. We’ve been watching this small but fascinating revitalization project for a while. 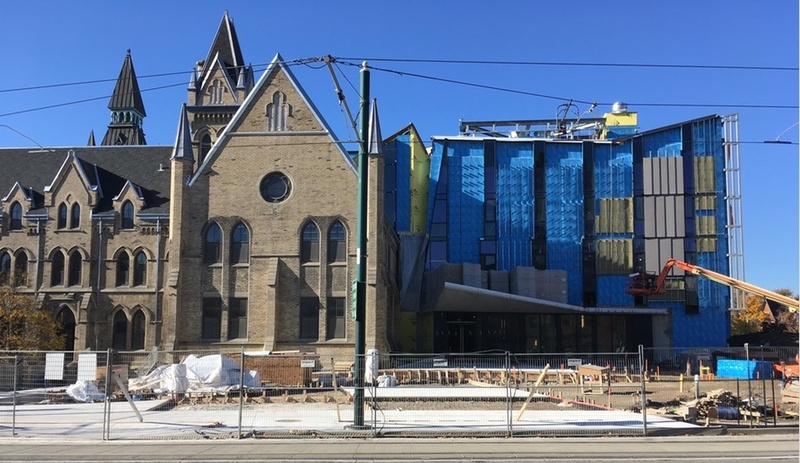 In the works since 2013, the University of Toronto architecture faculty’s new home should be ready this spring. The two-phase project, led by Boston firm NADAAA, began with the restoration of a local architectural landmark, a 19th-century Neo-Gothic building prominently located at the centre of a traffic loop. After years of maintenance neglect, the building had deteriorated significantly. Freshening the masonry facade involved replacing the original windows with insulated double-hung exact replicas and having the brickwork cleaned and re-pointed (and replaced where necessary). 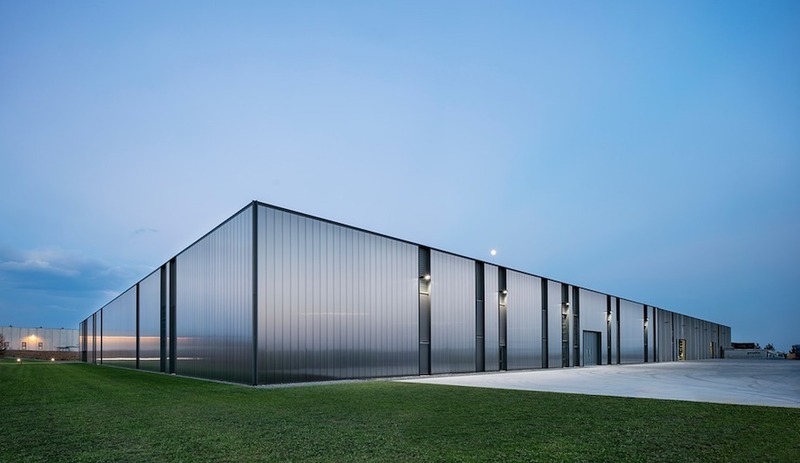 NADAAA’s addition is a concrete, glass and aluminum volume that rises with an angular profile from the northern side. The positioning of this structure presents an architecturally compelling face for traffic flowing north to south. Where there was once a parking lot and backside of a decaying building, there will now be a wall of glass looking into new studio spaces for grad students, and defined by a cantilevered ceiling. The joint buildings will also provide an east-west pedestrian path, a connection that has been inaccessible to the public for years. The online retail giant’s new Seattle campus is impressive in its scope. When it is complete, its headquarters will span three city blocks and encompass three high-rise and two mid-rise office towers and a 2,000-seat meeting centre. But it’s the biosphere, the “tiniest” element of the sprawling campus, that is the most anticipated. 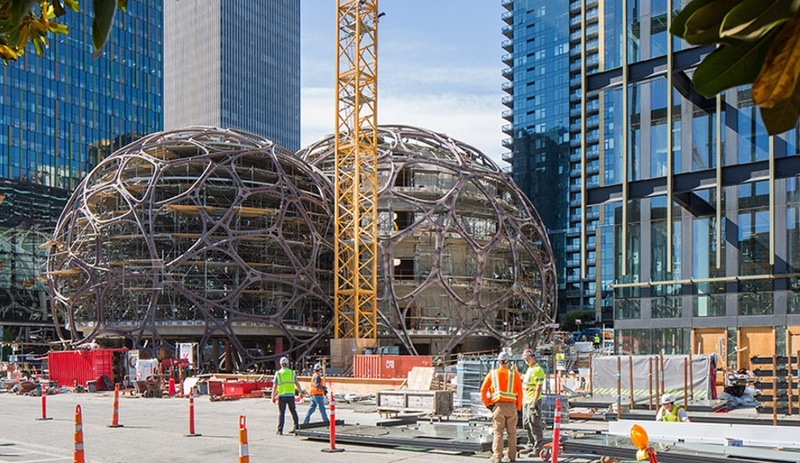 Like giant soap bubbles, three pentagonal domes are now taking shape on the streetscape. Their steel exoskeletal structure is almost entirely clad in glass at this stage, allowing passers-by to get a better idea of how the planned tropical rainforest will be contained within the domes. The five-storey structure will be filled with some 300 types of foliage from 30 countries. Amazon employees (and the public) will be able to visit to take in the jungle that includes a river, waterfalls and towering trees. Suspension bridges and tree houses throughout will offer destination points for taking it all in from above. Official completion is expected in early 2018. 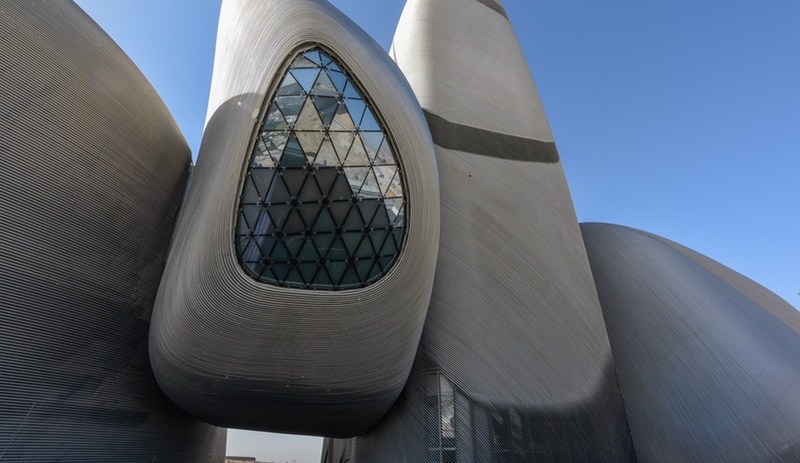 Norwegian firm Snøhetta designed this striking cultural centre in eastern Saudi Arabia to resemble a collection of stones whipped smooth by the wind. 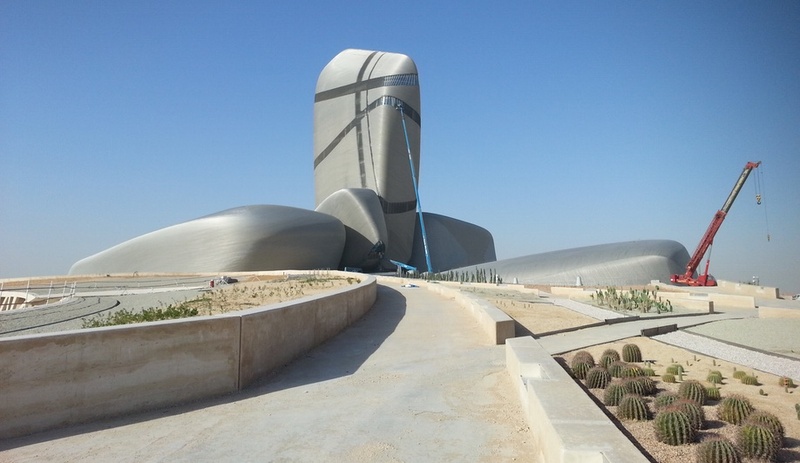 The 100,000-square-metre centre will contain an auditorium, cinema, exhibition hall, museum, archive and library containing some 200,000 works available to the public. 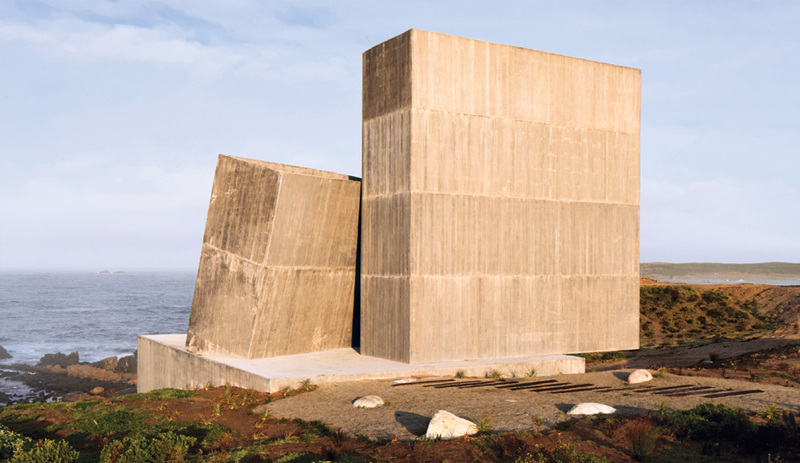 Clad in stainless steel pipes that trace the contours of each “stone,” the loose mound of volumes shimmers in the sun. The central monolith is flanked by, and suspends, smaller, neighbouring buildings. The firm won the competition in 2007 and began work a year later. It is now on the brink of completion – remarkably, ahead of schedule.